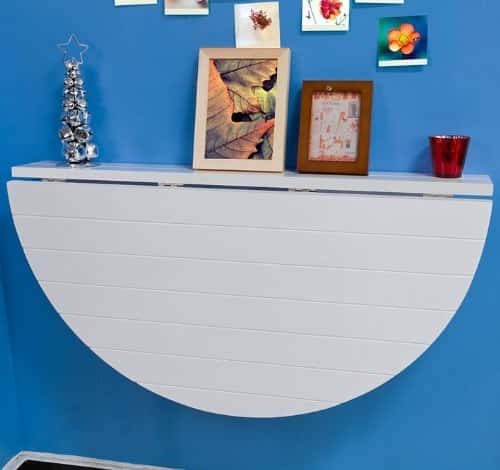 If you are looking for a desk, extra shelf or bench space in the pefect position then a floating wall mounted desk is the perfect way to create it instantly. Can easily be uninstalled and moved when you are no longer happy with the position. All hinges and fixings are inlcuded. The floating desk folds down when it is not in use so that you can make the most of the space for other purposes. The desk top is 80 cms wide, 52 cms deep (max) and the folding circular section has a radius of 40cms. Small enough for a small spae and big enough to be useful. Folds down out of the way when not needed. 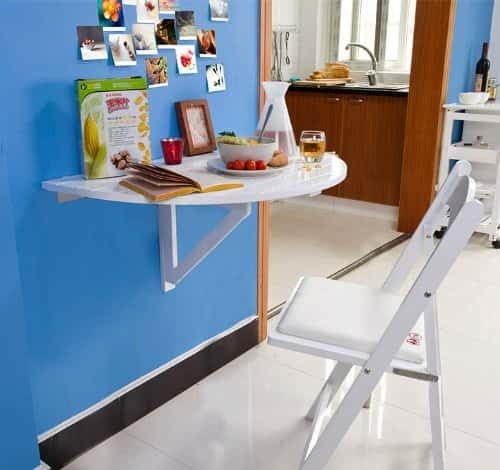 Because the desk is wall mounted you can install it at a height that suits you best. It can also be used as a shelf when it is folded down. This is a best selling item that has been highly recommended by reviewers and by people who have purchased it. The desk is only $42.95 which is inexpensive compared to many other desks. Especially when you consider all of the conveniences that this workspace provides. The Floating Wall Mounted Desk is avalable on amazon you can check it out here > Sobuy Solid wood, wall-mounted, drop-leaf semi-circular table, FWT10-W .